I read so freaking much this week that I literally have books coming out of my ears. It's a good thing, I guess, but it's also making me feel seriously overwhelmed. I just can't help myself, though. I've been really stressed about a lot of things this week and haven't been sleeping well. I've also been taking my WIP writing really slow, which I feel guilty about. Hopefully this week is more....relaxing. So I went a bit mad with Netgalley requesting and got this bunch of eBooks. (Bride of the Sea isn't from Netgalley though; I got that eBook from the author). I went to Pan Macmillan's annual media presentation on Friday and it was my first time going to a book event. It was amazing. They told us about the books they're bringing out this year, and everyone got an incredible goodie bag (see below). 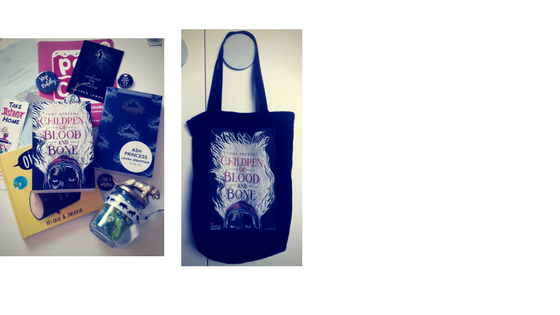 I am so thrilled about getting Children of Blood and Bone and an ARC of Ash Princess! Eeeep! Another awesome thing about the event was that I got to meet my blogging friend, Ruby, in person. It was so great! Rachel McAdams is pregnant with her first child! Not only is the amazing Lupita Nyong'o producing the upcoming movie, but she'll also be starring as Noah's mother. This week, I'll be reviewing Roar, Empire of Storms, and A Court of Wings and Ruin in a mini review post, I'll have another Romanticised Abuse post up, a blog tour promo, a Monthly Wrap-Up, and a review of Mercury Rises for its blog tour.